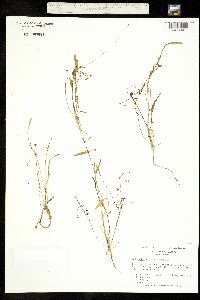 Herbs, annual, relatively slender, to 25 cm; rhizomes absent. Leaves: submersed leaves mostly present, sessile; emersed leaves with petioles 4--5-ridged, 1.2--9.5 cm; blade with translucent markings absent, linear, 1--7.4 × 0.2--0.5 cm, base attenuate; if emersed, narrowly lanceolate to ovate. Inflorescences umbels, rarely racemes, of 1--2 whorls, each 4--6-flowered, erect, to 6 ´ 8 cm, not proliferating; peduncles terete, 1.2--4 cm; rachis absent or if present, terete; bracts connate ca. ½ length, deltate, 2.8--4.9 mm, coarse, margins delicate; pedicels spreading, 0.5--3 cm. Flowers 6--8 mm wide; sepals slightly appressed, 3--5-veined, veins not papillate; petals clawed; stamens 9; anthers basifixed; pistils 15--20. Fruits obovate, flattened, 0--3-ribbed, not abaxially keeled, 0.8--1.5 ´ 0.8--1 mm, glands absent; beak lateral, 0.1--0.2 mm. Chromosome number unknown. Flowering summer--fall. Sandy soil along margins of small streams or lakes; 0--1500 m; Ala., Conn., Fla., Ga., Ill., Kans., Mass., Mich., N.Y., S.C., Tex., Vt.; se Mexico; West Indies; Central America (Guatemala, Nicaragua); South America. Echinodorus tenellus has often been separated into two species, one in North America and the other in the tropics. Whenever Echinodorus is studied throughout the range, differences between the two species break down, and a continuum exists from one species to the next. We recognize that overlap; therefore we are combining E. parvulus with E. tenellus. Annual aquatic herb to 25 cm tall Leaves: with linear submersed leaves and emersed leaves 1 - 7.4 cm long, 1 - 3 cm wide, linear to lance-shaped or narrow egg-shaped with a tapered base, with a long four- to five-ridged stalk. Inflorescence: with 0.5 - 3 cm long stalks radiating from a single point (umbel), rarely singly stalked along a central axis (raceme), borne on a main stalk that is circular in cross section and 1.2 - 4 cm long, terminating in three to six flowers. Flowers: 6 - 8 mm wide, with 1 - 2 mm long sepals that are three to five veined and somewhat appressed in fruit, three white to pink petals that are 1 - 3 mm long and clawed, and six or nine stamens. Fruit: a loose spherical cluster of ten to twenty achenes. Each achene is dark red to nearly black, 0.8 - 1.5 mm long, inversely egg-shaped, flattened, ribbed, with a very short lateral beak. Bracts: 1 - 3 mm long, triangular, coarse with delicate margins, fused about half the length. Similar species: The similar Echinodorus berteroi is usually over 15 cm tall with egg-shaped or broadly lance-shaped leaves, 5 - 10 mm petals, nine or more stamens, and greater than 40 achenes per head. Habitat and ecology: A rare species found in wet ditches. Etymology: Echinodorus comes from the Greek words echinus, meaning "rough husk," and doros, meaning "leather bottle," referring to the prickly fruit. Tenellus means "delicate."